This article is about the neighbourhood. For other uses, see Willowdale (disambiguation). Willowdale is a neighbourhood in the city of Toronto, Ontario, Canada, located in the district of North York. It developed from three postal villages: Newtonbrook, Willowdale and Lansing. Willowdale began as a postal village (orig. Willow Dale) which covered the area from Finch Ave. at the north to Elmwood Ave at the south and Bathurst St. at the west to Bayview Ave. at the east. The postal village of Lansing was from Elmwood Ave. at the north to approx. Hwy. 401 at the south and Bathurst St. at the west to Bayview Ave. at the east. (East of Bayview Ave. was the postal village of Oriole.) The north–south centreline of Lansing & Willowdale was Yonge St. The postal village of Lansing remained in existence until the post office at Lansing corner (northwest corner of Yonge St. & Sheppard Ave.) was closed. When a new post office was built in Willowdale, the postal villages of Lansing and Willowdale were combined as the new postal village of Willowdale, within the Township of North York. North York City Centre is centred at the intersection of Yonge Street and Empress Avenue/Park Home Avenue and is commonly thought to be a part of Willowdale, though its high-rise residential and commercial development sets it apart from much of the rest of Willowdale. The Willowdale neighbourhood consists of single-family homes, condominium townhouses and high-rise condominium towers. High density development is restricted along Yonge Street. Willowdale was first settled by Jacob Cummer (Jacob Kummer), who immigrated to Canada from the United States in 1797. Cummer was a mill owner on the nearby Don River, a proprietor of a tinsmith shop on Yonge Street and a self-trained doctor and veterinarian. Cummer was held in such high esteem by his neighbours they called the area "Kummer's Settlement". Cummer Avenue is named for Cummer. David Gibson, a distinguished land surveyor, was another leader in this community. Like most of his neighbours, Gibson participated in the ill-fated Upper Canada Rebellion of 1837. He was thus charged with high treason and escaped to the United States, where he found employment as the First Assistant Engineer on the building of the Erie Canal. The Gibson family built the Gibson House in Willowdale in 1851. Gibson returned to his Yonge Street farm in 1851, after being pardoned for his role in the Rebellion. He then helped to establish the "Willow Dale" post office, named after the many willow trees that once graced this district. Members of the Gibson family were still living in Gibson House in the 1920s when the residential subdivision of Willowdale began to take place. The Gibson House, built in 1851 in the Georgian Rival style, still stands in its original location at 5172 Yonge Street, and is now a historic house museum. Opened in 1948, York Cemetery was located in the southwest of the neighbourhood. Several notable individuals are interred there, including the Grand Duchess Olga Alexandrovna of Russia, and Tim Horton. The single-family homes range in age from the original 1910 to 1950s construction (one- and two-storey pre-war houses and modest one-and-a-half-storey postwar houses). Large two-storey luxury homes emerged in the neighbourhood in the early-1990s. After the 1990s, very large replacement two-storey luxury homes were constructed by tearing down the original houses. It is in this neighbourhood that the term "monster homes" was first applied by Torontonians. In 2018, the Toronto van attack, the deadliest vehicle ramming attack in Canadian history, occurred in Willowdale. The first church in Willowdale was called the Cummer Chapel, located at the northwest corner of what is now Yonge and Churchill. This log meeting house was built in 1816 by Jacob Cummer on part of his farm. He and other early members of the church are buried in the cemetery which remains on the site, now on the east side of Yonge Street. The Cummers, who were the first German loyalists and farmers from Pennsylvania, had Lutheran roots. However, they readily mixed in with and married people with Methodist and other roots. Thus the chapel was designated as non-denominational. The current building for Willowdale United Church was erected in 1954. A large, yellow, brick and stucco church with a tall spire replaced the log building in 1856. It was called the Methodist Episcopal Church, and became part of the new United Church of Canada in 1925. Between 1931 and 1932, Yonge Street was widened and the front end of the church, facing west, was removed. The front door was relocated to the south side of the building. Following World War II, many veterans and their families began to settle in Willowdale. In 1946, the Rev. Welburn Jones became the minister of Willowdale United Church (WUC) and initiated a building program. In 1954 a substantial building was built on nearby Kenneth Avenue. In 1966, his successor, the Rev. Lindsay G. King, completed the program. The Rev. King spent the rest of his ministry, 27 years, at WUC. While he was the minister of WUC, the Rev. King wrote a regular column for the community paper and he was frequently heard on radio and television, including the CTV and the CBC. Because of his lifelong interest in bringing psychology, religion and health together, in 1973 he initiated the founding of the Family Life Foundation (FLF) of Willowdale, a registered charity encouraging the development of healthy community and family life. Home to 79,440 people, Willowdale is an ethnically diverse community, with 66% of all Willowdale residents being immigrants as of 2011. Major ethnic groups in Willowdale include: Chinese: 17.3%, Korean: 8.0%, and Iranian: 7.8%. While English is the mother tongue for 33.7% of the population, other languages with large numbers of speakers include: Chinese: 18.4%, Persian: 9.7%, and Korean: 9.2%. In 2006, census tract 0300.00 in Willowdale was 82.15% Canadian citizens and 17.85% Non-Canadian citizens. However, in the Canada 2011 Census, it changed to 76.89% Canadian citizens and 23.11% Non-Canadians. Earl Haig Secondary School is a public secondary school located in Willowdale. Two public school boards operate schools in Willowdale, the separate Toronto Catholic District School Board (TCDSB), and the secular Toronto District School Board (TDSB). The headquarters for both TCDSB, and TDSB is located in the neighbourhood. TDSB operates one secondary school in the neighbourhood, Earl Haig Secondary School. TCDSB does not operate a secondary school in the neighbourhood, with TCDSB secondary school students residing in Willowdale attending institutions in adjacent neighbourhoods. The French-first language public secular school board, Conseil scolaire Viamonde, and it separate counterpart, Conseil scolaire catholique MonAvenir also offer schooling to applicable residents of Willowdale, although they do not operate a school in the neighbourhood, with CSCM/CSV students attending schools situated in other neighbourhoods in Toronto. A view of Mel Lastman Square, a public square near Yonge Street. The neighbourhood is home to several public parks, including Bathurst Park, Edithvale Park, Finch Avenue Hydro Corridor, and Sheppard East Park. Parks in Willowdale are managed by the Toronto Parks, Forestry and Recreation Division. In addition to municipal parks, the municipal government of Toronto also manages North York Central Library, a branch of the Toronto Public Library. Located on Yonge Street, Mel Lastman Square is a public square that hosts a number of events. The square is situated next to North York Civic Centre, a building used by the municipal government. In addition to public amenities, the neighbourhood is also home to Empress Walk, a condominium and retail complex that includes an IMAX cinema operated by Cineplex Entertainment. Several major roadways are situated in the neighbourhood. Yonge Street is a major north–south roadway, and a major commercial thoroughfare in Toronto. Bathurst Street serves as the neighbourhood's eastern boundary, whereas Bayview Avenue serve as the neighbourhood's western boundary. The neighbourhood's northern boundary is the Finch Avenue Hydro Corridor, situated just north of Finch Avenue. 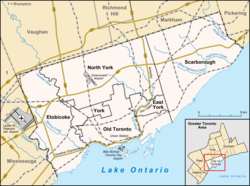 The southeastern part of the neighbourhood is bounded by Highway 401, a major east–west controlled access highway that passes through Greater Toronto. Other major roadways in the neighbourhood include Sheppard Avenue, an east–west thoroughfare. Finch station's kiss and ride entrance is located in the northern portion of Willowdale. Public transportation in Willowdale is served by the GO Transit, the Toronto Transit Commission (TTC), and York Region Transit (YRT). The TTC operates several transit services in the neighbourhood such as the Toronto subway. There are four subway stations situated in Willowdale, Bayview, Finch, North York Centre, and Sheppard–Yonge station. Bayview station provides access to the Line 4 Sheppard subway, whereas Finch, and North York Centre stations provide access to Line 1 Yonge–University. Sheppard–Yonge station serves as a major interchange station for Line 1 and Line 4. In addition to the subway, the TTC also operates bus routes in Willowdale. TTC buses may be accessed at subway stations, and bus stops located throughout the neighbourhood. In addition to the TTC, bus routes operated by GO Transit and York Region Transit may be accessed at Finch, and Sheppard–Yonge station. The opening line of the song "The Necromancer" by Rush is: "As grey traces of dawn tinge the eastern sky, the three travelers, men of Willowdale [or Willow Dale], emerge from the forest shadow. Two of the three travelers is a reference to Geddy Lee and Alex Lifeson, both of whom grew up in Willowdale." The cartoon series Mother Up! starring Eva Longoria is set in Willowdale. ^ "Willowdale, Toronto Homes and Real Estate - Royal LePage Signature Realty". Andrewhomes.ca. Retrieved 2 March 2019. ^ "Ward 23 Willowdale Profile" (PDF). City of Toronto. Retrieved 2015-10-18. Wikimedia Commons has media related to Willowdale, Toronto. "Topographic Map sheet 30M14". Atlas of Canada. Natural Resources Canada. 2006-02-06. Retrieved 2009-01-08. "Gibson House Museum". City of Toronto. Retrieved 2009-01-08.